Canon DSLR Tethering. Now it’s easy. New version 5.4 available. Click to see what's new! Turbocharge your Canon DSLR by controlling it with your PC. Used by thousands of photographers in studios, movie sets, museums, laboratories, schools and backyards worldwide. Explore how ControlMyCanon can improve your photo shoots. Reduce re-shoots and post-processing by using live view in a window or full-screen or even on another monitor to make sure your composition and exposure is perfect before you take the shot. Exposure – show areas within a range of exposure, and outside of it. Grid – overlays custom horizontal and vertical lines and rebatments. Focus Peaking – shows which areas are in focus. Overlays – apply a jpg or png on top of the live view image. Photo Trap – capture images with motion detection. Brightness Control – perfect for those dark live view scenes. Read more about it here. Video tutorial included! With tethering, you avoid the problem of bumping your carefully composed shot when you need to adjust camera settings. All you need to do is point and click to adjust your settings on the ControlMyCanon screen and you are good to go. And when you are ready to shoot, just click on the Shoot buttons or use the camera shutter release, mouse, keyboard or one of our configurable triggers. And if you would like to re-use these particular settings later, save them as a Profile. You can use profiles to quickly restore all your settings instead of setting each item again. Magnifier – Simply double-click the image to toggle the loupe. Exposure Tracker – Shows the overall exposure as well as the exposure of the pixel under the mouse cursor. Includes a histogram. Metadata – Shows Exif and IPTC fields in a hide-able pane. Thumbnails – Configure which data to show with each thumbnail. Detach – Resize and/or drag the browser to another monitor. Shown in Viewer – Shows the image on another window that you can drag to another monitor. You can tell ControlMyCanon to capture an image or video by using the mouse and keyboard, as well as our custom triggers. Web – shoot from your smartphone or browser. Perfect for when you need a remote. Sound – shoot when a noise is detected. TCP/IP – shoot when a command is received from a custom app. Speech – shoot when you speak a word or phrase. Great for hand-holding lights and shooting at the same time. Motion – shoot when motion is detected during live view. Now you can literally capture images of those elusive backyard birds while you are off doing something else. Many of our users do this, with great results. Powerpoint Remote – shoot when a button is pressed. A great inexpensive remote that can be used during live view. 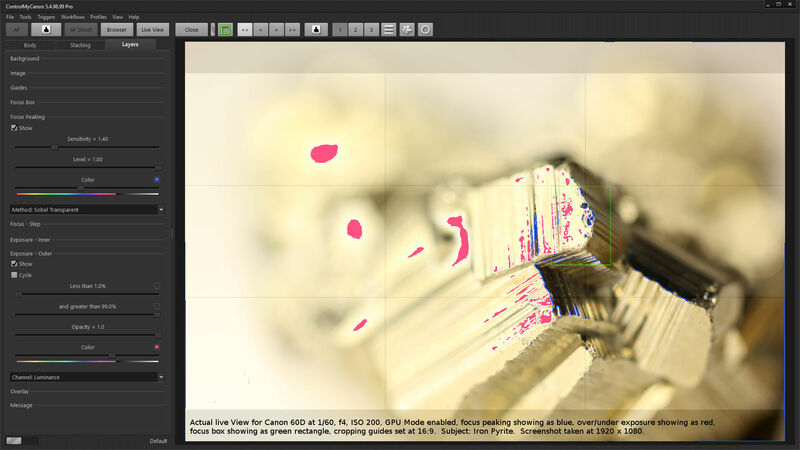 Use our pre-defined workflows to guide you through complex image capture scenarios. 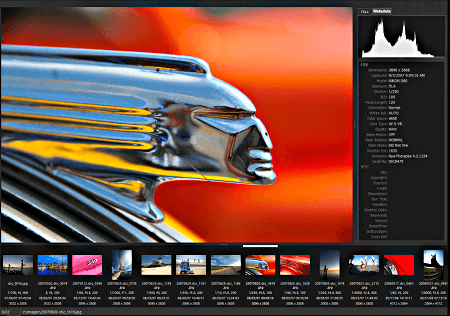 HDR – Capture a series of images with varying shutter speed. Bulb – Capture an image using bulb mode. Burst – Quickly capture a series of images using continuous mode. Pulse – Capture an image every x seconds. Batch – Embed your own data into image folder/filenames and IPTC fields. Can be used with a barcode reader. Time-lapse – Capture a series of images over time. Stop-motion – Capture a series image for making a stop-motion video. Long Exposure – Capture a very long exposure. Focus Stacking – Capture a series of images of limited depth of field that can be combined for greater depth of field. 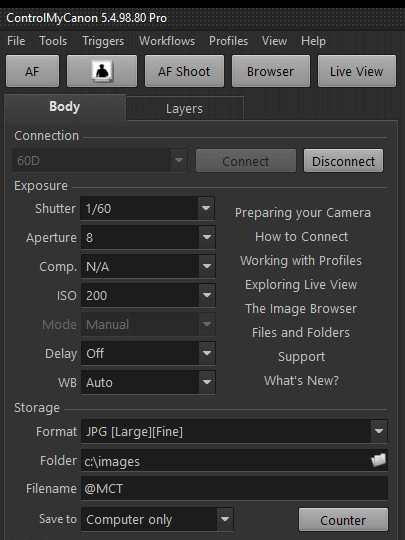 Take advantage of ControlMyCanon’s extensive options for naming files and folders. Use numbering, dates and even embed data from batch shooting sessions. File and folder names modified by a barcode? Yes, it can do that too. And for safe keeping, use ControlMyCanon’s optional mirroring function to transfer a copy of your captured image to another location, such as a network or USB drive. Perfect for those product, school, lab or other shoot that requires accurate record keeping. With the batch shooting feature, you can import a data file in advance of your shoot or query a live database and have ControlMyCanon embed the data into your image filename, folder name and metadata. If you don’t have a data file, you can embed the barcode instead. You can even use an optional barcode scanner for bulletproof data entry. Keeping all those images organized has never been so easy. 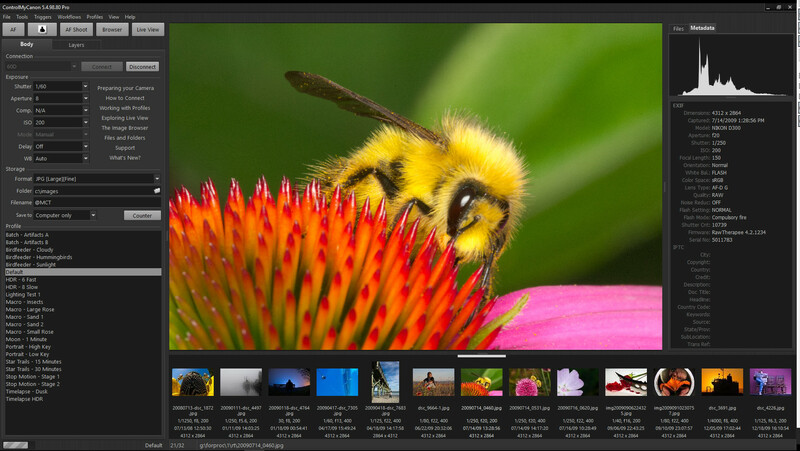 Use the built-in Image Browser to check your composition, focus and metadata. You can detach it and put it on another monitor too. Use live view’s focus peaking, exposure, grids and cropping to reduce re-shoots. And you can detach this one to another monitor too. Select one of over 100 themes to find a look that is best for you. Make changes to the camera settings and then save it as a profile. You can have as many profiles as you like and switch profiles when needed. This saves a lot of time. 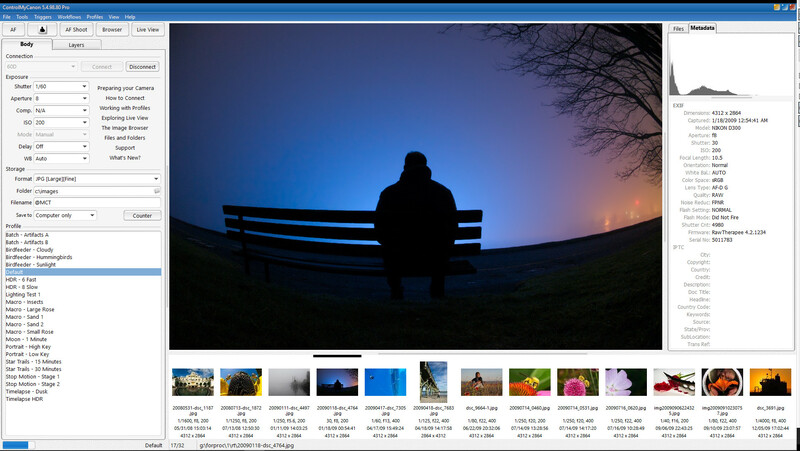 Detach the live view, image browser, or both and arrange them on other monitors. Or clone the live view and image browser windows so that they can exist on separate monitors. Send commands to ControlMyCanon via your own app, or send each image after capture for further post-processing via batch file. Embed your own data into IPTC fields for each image. If using the Batch Workflow, you can even embed data from your barcode or linked data. Use live view’s Copystand mode so that you can easily compose by moving the subject on the copystand. Move it right and moves right in live view, etc. Easily capture and assign a white balance to your custom white balance settings. Use a white or grey card of your choice. Use the built-in shortcuts and customize your own for pretty well every function. Camera communication image processing run on their own threads for maximum performance on multi-core cpu’s. 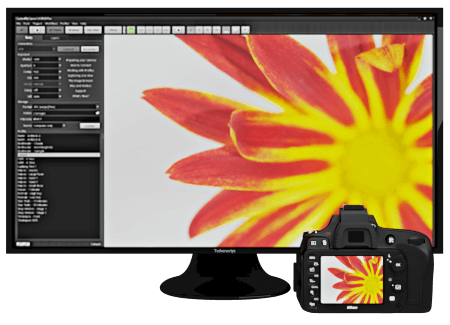 Capture images by using a separate DSUSB device. Great for long-exposure captures for those cameras that don’t allow tethered bulb shooting. Use the StackShot motorized rail to move your camera for focus stacking. Great if you don’t have a lens with a CPU-controlled focus motor. Uses Canon’s official Software Development Kit so you know that the camera is controlled in a safe, Canon-approved manner. Customize the look and feel by choosing from over 100 themes and adjustable font sizes. Your eyes will be much happier. Print contact sheets right from the image browser. Over thirty tutorial videos, a full knowledge base and online and in-app help will get you up and running in no time. Our free tutorial videos, online help and knowledge base will get you going in the right direction. And if you still have questions, send us a support request and we will be happy to help. It's all you need to take your photography to the next level. A great way to learn how to use ControlMyCanon. Lots of great articles with tips and tricks on how to get the most out of ControlMyCanon.